Adi Maopa Secondary School athletes and officials at Dudley Intermediate School in Suva on April 13, 2019. Adi Maopa Secondary School will use the Fiji Secondary Schools Athletics Asso­ciation national finals (Coca-Cola Games) to give its students expo­sure and develop champion ath­letes for the future. 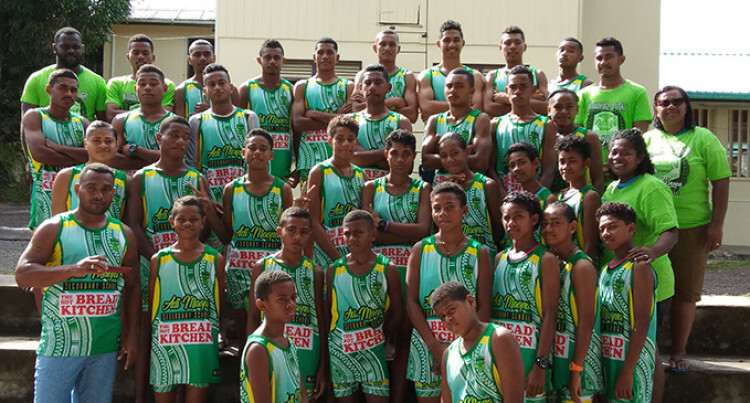 The Lau Island- based school will field 30 athletes of 18 boys and 12 girls- at tomorrow’s Games, 26 more than last year. They come into the Games on the back of winning the boys division of the Maritime Zone last Friday with 14 gold, 7 silver and 6 bronze medals. Assistant principal Arieta Kaseni said the school was looking to give their athletes as much exposure as possible during the Games to build for the future. “The students are looking for­ward to Games after experiencing the competitive atmosphere of the maritime zone last week,” Kaseni said. “I’m also urging Lauans, especial­ly those from Vanuabalavu, to come out in numbers and support the school. We also have t-shirts which they can order to support our ath­letes,” she said. Island schools arrive to Suva one week before the Coke Games to compete in the Maritime Zone. This also gives them a chance to familiarise themselves with the sporting facilities in the capital which are not available on the is­land. However, bringing a large number of athletes and officials to Suva can be a costly affair which the school has to find ways to finance.